Surgical treatment is identical for both intravaginal and extravaginal torsion and consists of scrotal exploration. If the testicle is necrotic it should be removed. If the testis appears nonviable initially, it should be placed in a warm gauze pad. Appropriate color and turgor may return, in which case orchidopexy should be performed; otherwise orchiectomy is recommended. For the viable testicle, orchidopexy with creation of a three-point nonabsorbable suture fixation of the testicle should be performed. Some authors also advocate placement of the testicle in to a subdartos pouch to fix the testicle by tissue as well as by suture. 12.4. 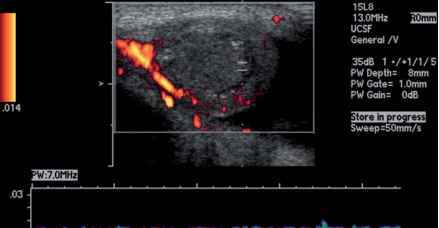 Color Doppler ultrasound image of testicular torsion. 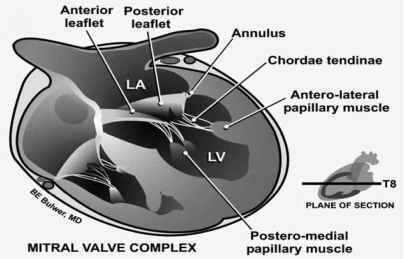 Note the absence of flow to the testicle didymitis, torsion may still occur. A patient may claim testicular trauma, but torsion may actually be the reason that patient is in the emergency room. Finally, paradoxically, even if a patient had a previous orchidopexy, they may (rarely) develop torsion again (Mor et al. 2006)! If a testicular torsion is not repaired and testicular loss occurs, the dead testicle should be removed because of the possibility of the development of significant orchalgia, as well as the theoretical risk of the production of antisperm antibodies as the blood-testis barrier breaks down (Anderson and Williamson 1988). However, some authorities advocate leaving the testicle in place so as to maintain Leydig cell function (testosterone production). Contralateral orchidopexy is often performed, but this approach continues to generate controversy. Manual detorsion has been reported by one group.